A short walk from the coast, this lovely clinic is a 5 minute drive from the A338 and a short walk from Pokesdown train station or an 8 minute walk from Boscombe Bus Station. 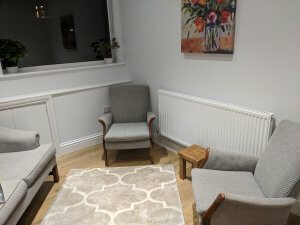 Dr Lauren Rooney works in this clinic and offers therapy for adolescents and adults across the age span, using a variety of therapy models including CBT, ACT and psychodynamic therapies. She is registered with the HCPC. If you would like to make an enquiry, please contact Avenue Therapies central office through the contact details on this website. The waiting area has tea and coffee making facilities, do help yourself and Lauren will meet you here. The clinic is in a residential area with ample free parking on the street.